Moritz (Zach Zupke) and Melchior (Michael Schulz). 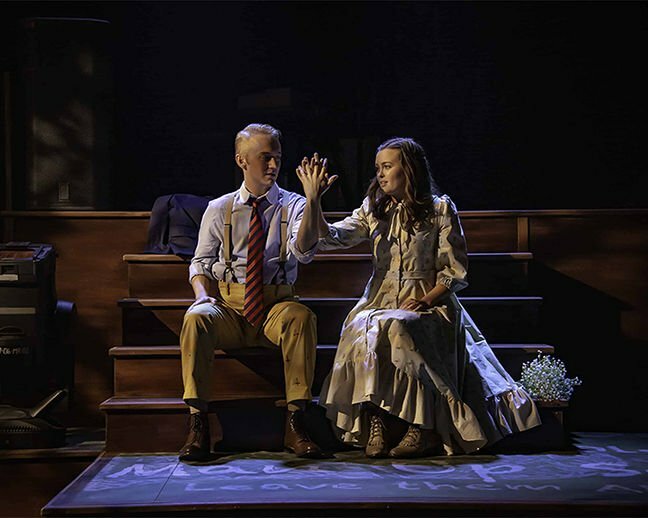 Spring Awakening is based on the late-19th-century play The Awakening Spring, A Children’s Tragedy by German playwright Frank Wedekind. This modernized version is an austere depiction of oppression, rebellion, and sexuality, featuring maturing kids finding their bodies amongst shifting roles—girls drool over guys who don’t care about anything but are good at everything, while the guys suffer explicit fantasies about their piano teachers. Typical. This multiple Tony Award-winning musical features Steven Sater’s cringy, angsty songs about new ways to touch oneself. But Stratton, according to his recent interview in the Arizona Daily Star, is OK with that. He “expects some audience members to be uncomfortable.” And well, it is. While the script leaves something to be desired, there are key performances that pack a punch: much of the movement is purposeful and well timed—a particularly satisfying scene features caustic schoolmasters, headbanging and air-guitars. And there were stand out vocals by actors Jared Machado (Georg/Dieter) and Rachel Franke (Wendla). Where this play really shines is with the set design, technical, and costuming teams. The design of the theater is such that some audience members sit only feet from a technician, but wouldn’t know it due to the team’s utmost professionalism. They execute their jobs efficiently and in perfect unison. And the design team finds new ways to tell an old story. The set explores space in funky ways thanks to scenic designer Joe C. Klug. Chairs hang from ceilings and the floors become a place to take notes. Lighting designer Tori Mays rounds out a visually creative production with unlikely textural choices, employing geometric gobos and infusing many scenes with disconcerting chartreuse. Costume designer Ryan B. Moore goes for symbolic touches by stitching tiny crosses of Peter onto the boys’ uniforms. This cross is a common symbol in counter-culture scenes, serving as a sneaky reference to the defiant nature of the students. 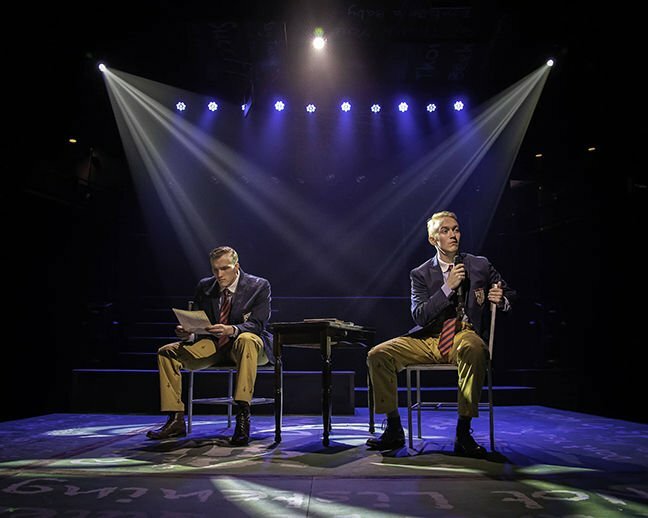 Another great component of this production was the live musical accompaniment—a classy touch that fosters a multisensory opportunity to connect with the play’s ethos. In many other productions they’d be hidden in a pit, but in this production they are instead proudly displayed for the audience as an essential organ, pumping their feet in tune, plucking their fingers in a rhythmic heartbeat that circulates vital energy throughout. This review originally appeared at tamingofthereview.com, a female-led, local, diverse and community-oriented collective dedicated to coverage of Tucson theatre.